Look what a variety of events & activities we have planned! We have quite a few events and activities arranged already for the year and do hope that you will be able to come along and support us at some of them. There is quite a variety of activities and we hope there should be something for everyone to enjoy. *** As usual they are all listed with additional detail on our website ‘Events’ page http://www.cheadleanimalwelfare.org.uk/events/. Please take a look and note your diaries! Winter events already booked too! plus a great Mini Auction Evening event in April which will have its £7 tickets available to buy at E + E furniture Stores, High Street Cheadle from 26th February or by ringing 01335 390369. 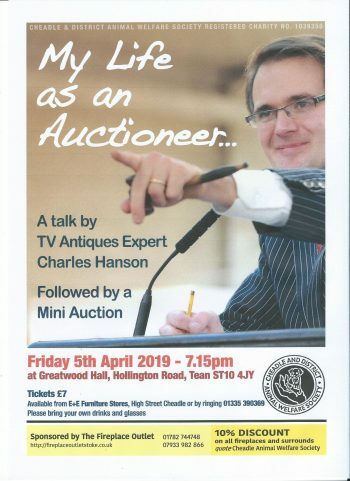 This ‘Evening with Charles Hanson’ one of TV’s favourite Antiques Experts will be a very entertaining evening if his past auctions for us are to go on! This is on Friday 5th April starting at 7.15pm at The Great Wood Hall, Tean. Bring Your own drink & glasses please. ** Enjoy 10% discount on all fireplaces and surrounds simply by saying ‘Cheadle Animal Welfare’ when you contact them.